Discription:This sandwich consists of grilled chicken breasts topped with provolone cheese, caramelized onions, and sliced avocados. Seriously, could this get any better? The end result is delicious. 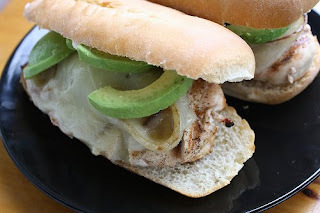 If you enjoy chicken sandwiches, give this recipe a try for your next cook out. Enjoy. Step 1: In a bowl combine sliced avocado and lemon juice. Add water to cover. Set aside. Step 2: In a skillet over medium high heat, heat butter and sauté onions until brown and caramelized. Set aside. Step 3: Heat an outdoor grill or indoor grill pan. Season chicken breasts with salt and pepper. 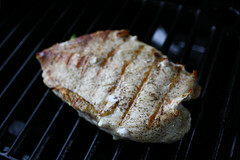 Place on your grill and cook chicken until no longer pink inside (about 5 minutes on each side). Place hamburgers buns on the grill and lightly toast them. Step 4: Spread buns with mayonnaise and then stack on the chicken breast, onions, cheese and avocado slices.